Information Located beside Semple Creek and the former Brule School, this trail is a 1 km loop with a gravel surface. It is rated "easy" and is considered wheelchair accessible. Permitted use of the trail includes walking. 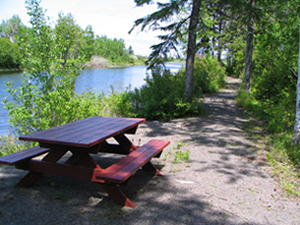 Access to the trail can be found at the Brule Community Centre, 3971 Route 6 in Brule. Parking is available.